The Gunn Report has announced the top 20 ads from the 21st Century and we're made up to read that 25% of them were made by W+K! That's right. Five of the best 20 ads of this century (so far) were originated in our network. 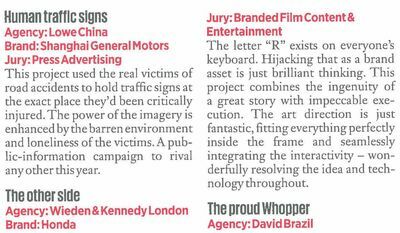 We're also incredibly proud here in London that two of those campaigns are home grown from our Hanbury Street office with Honda 'Cog' and 'Grrr' amongst the top 20. Also featured are Nike 'Write the Future' and 'Tag', and Old Spice 'The Man Your Man Could Smell Like' from W+K Amsterdam and Portland respectively. No time to rest on our laurels though. A quick pat on the back all round and back to making the best work of the rest of the century for us. 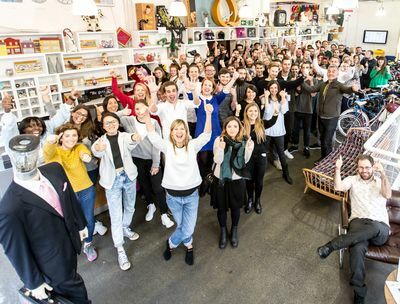 Following on from last week's Social Buzz wins at the Drum Awards, SocialBro has written up a lovely little round-up of the winners. We're incredibly proud that our #EndangeredEmoji campaign for WWF is featured and that our creative, Jason, who worked with partner Joris on the campaign is quoted. 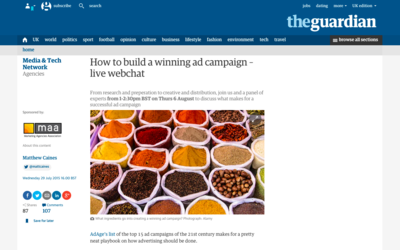 how do you build a winning ad campaign? Seeing as pretty much everything else seems to be happening online these days, why shouldn't we shift the classic panel debate format into a virtual space as well? 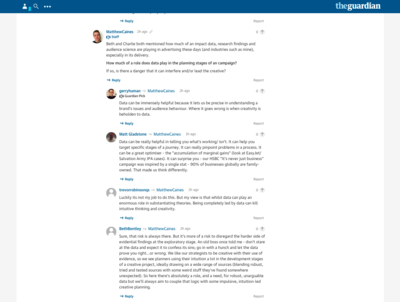 Our head of planning, Beth, was invited to take part in a Guardian live webchat about advertising, which is like a very clever and polite version of the debates that play out in a YouTube video's comment section. The topic today was "How to build a winning ad campaign." Want to know the secret formula? So do we. But for now, you can see the discussion (in reverse order) in the comments section below this article on the Guardian's site, and see what Beth and some of her peers have to say on the topic, including Gerry Human, chief creative officer, Ogilvy & Mather London and Trevor Robinson OBE, executive creative director and founder, Quiet Storm. 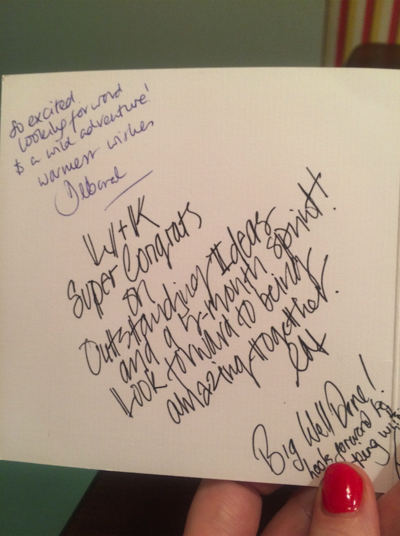 Author Wieden Kennedy LondonPosted on August 6, 2015 March 31, 2016 Categories in the press, our lovely peopleLeave a comment on how do you build a winning ad campaign? 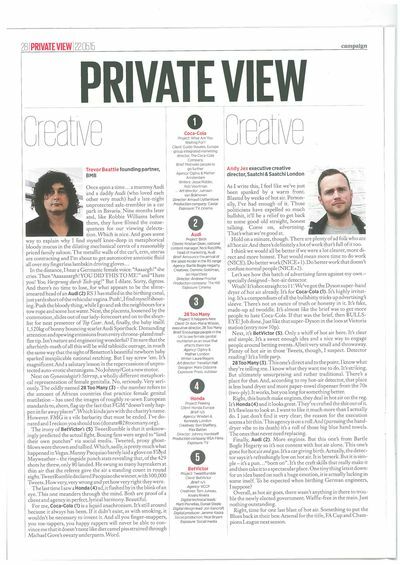 In Campaign's Private View this week, Trevor Beattie from BMB and Andy Jex from Saatchi & Saatchi gave our Honda Civic 'Feeling' ad two rather nice reviews. Thanks! Honda 'The Other Side' was also included in Campaign's 'President's Picks' feature, where D&AD president Mark Bonner dissected the best and most innovative work from this year's awards. 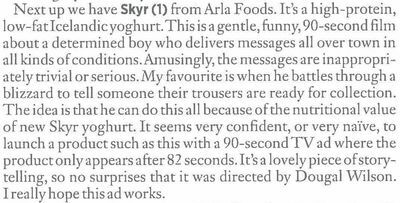 Our Arla Skyr ad focuses on a boy, fuelled by Skyr yogurt, delivering messages all over all his Icelandic town. 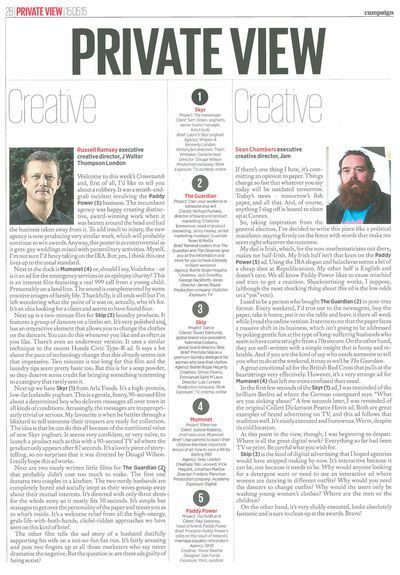 This week's issue of Campaign delivered us some rather nice messages in the form of Private View comments on the ad from Russell Ramsey, ECD at J Walter Thompson and Sean Chambers, ECD at Jam. 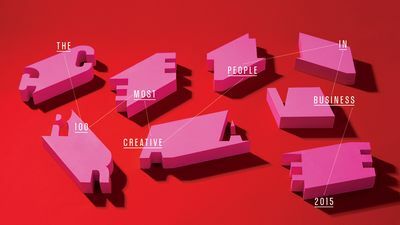 Each year, Fast Company magazine puts together its list of 100 Most Creative People in Business. 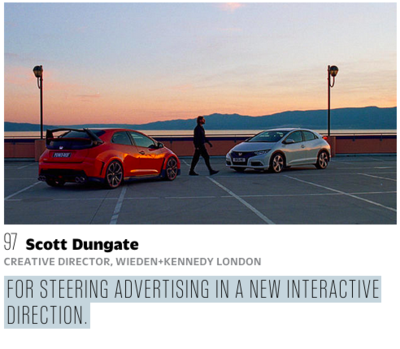 This year, we were absolutely delighted to hear that W+K creative director and all-round exemplary Aussie bloke Scott Dungate made the cut, for "steering advertising in a new interactive direction" with our Honda 'The Other Side' campaign. 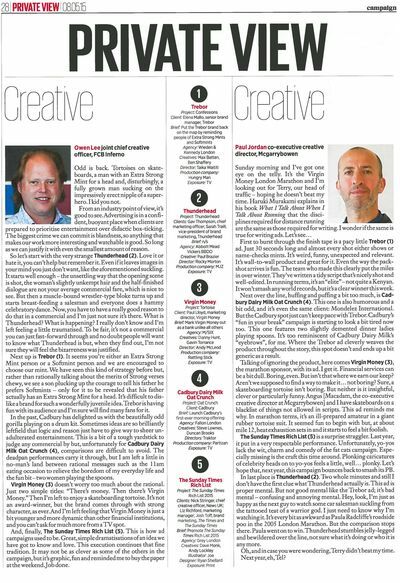 Not only that, but he seems to be the only creative individual from an ad agency on the list. Scott was interviewed by Fast Co about what inspires him, his morning routine and what he does to shake himself out of a creative rut. 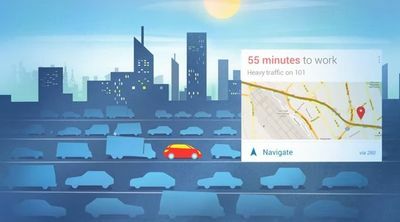 Check it out here, and then dive in to the full list on Fast Company here. 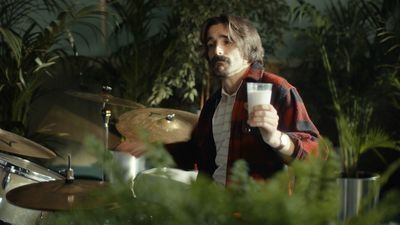 This spring, we’re bringing Cravendale back to British TV screens with a fresh new campaign which pays tribute to the most dedicated of milk drinkers. Did you catch our latest spot on telly this weekend? We like to think of Cravendale as “the milk drinker’s milk,” because it’s never better appreciated than when enjoyed on its own. And we think drinking milk is cool, so we wanted to find a way to salute milk drinkers whilst reminding the nation of the pure and fresh taste of Cravendale milk. 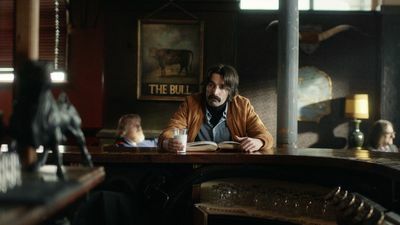 We teamed up with brilliant directing collective CANADA at CANADA London / Riff Raff to create a 30″ TVC, which introduces viewers to a cool, slightly mysterious character showing his love for Cravendale. And because he’s such a fan, he’s never seen without a glass of the white stuff in his hand. Whether he’s riding a mechanical bull or throwing shapes on the dancefloor, he never spills a drop. 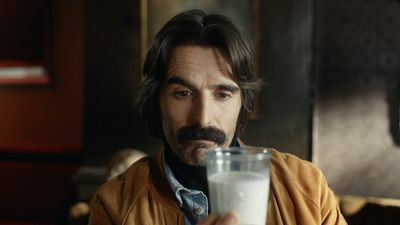 Shot in a movie trailer inspired visual style, the mustachioed milk drinker’s tale is told through a montage of scenarios that show his unfailing dedication to his trusty, ice-cold glass of Cravendale. Whether they're Extra Strong Mint people or Softmint people, according to Campaign, the British public seems to like our latest Trebor ad. Our 'Choose Your Trebor' ad received two rather nice reviews in Campaigns Private View this week from FCB Inferno CCO Owen Lee and Mcgarrybowen ECD Paul Jordan. Thanks!